McALLEN, Tex. — When a president comes to town there are two realities, the one the White House hopes to create and the one that actually exists. President Trump arrived in this city on the Mexican border on Thursday to dramatize his desire for a border wall, a hardened position that has caused the partial shutdown of the federal government. He surrounded himself with border agents, victims of horrible crimes, a display of methamphetamine and heroin, an AK-47 and an AR-15 rifle, and a trash bag stuffed with $362,062 in cash that had been confiscated by law enforcement officials. In his view, it all added up to a single word, “crisis,” with a lone solution, building a wall — a point he emphasized in a discussion with the crime victims, law enforcement officers and McAllen residents. But there was another reality. 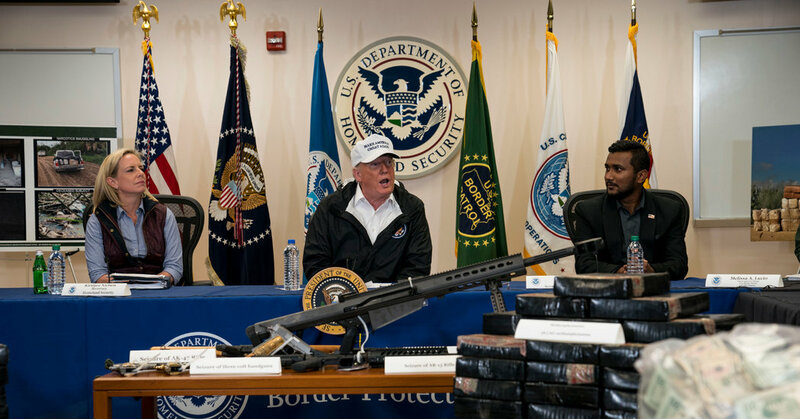 The display of drugs, weapons and cash was mainly the product of law enforcement actions stopping criminals at international bridges, where most drugs are smuggled, and conventional ports of entry. In a place where a wall is already in place, law enforcement officials boasted of apprehending criminals who had built a tunnel. The money was taken from a suspect who had overstayed a visa. In a meeting on Tuesday with network anchors before his prime-time address to the nation, Mr. Trump had dismissed the trip to McAllen as a waste of time, a mere photo op. But he gamely went forward after arriving here early Thursday afternoon. A few miles south of McAllen, he stood near a bluff above the Rio Grande, with Mexico in the near distance. There were more border agents, an array of military vehicles and a helicopter flyover for effect with agents saluting the commander in chief. The Fox host Sean Hannity stood nearby, waiting for an exclusive interview. Hundreds of people lined a nearby highway, many waving signs backing Mr. Trump. The border agents who assembled for the meeting also gave him hearty cheers. One supporter was Joe Cantu, a former police chief from a nearby town wearing a Make America Great Again baseball cap and T-shirt. “They’re coming over in Banzai waves,” Mr. Cantu said of immigrants crossing into Texas. On the route from the meeting to the photo op along the Rio Grande, the president’s motorcade also passed numerous product distribution centers, large, low-slung buildings that employ hundreds of people. Those businesses are a product of Nafta, the commercial agreement with Mexico and Canada that Mr. Trump has labeled the worst of all time, but that has transformed South Texas over the last two decades. The McAllen area is heavily Democratic and the local congressman opposes the wall, as do many local officials. Still, the scene was a draw. The city is certainly O.K. when it comes to crime, which is near a 30-year low. The president did not talk about that. “You’ll have crime in Iowa, you’ll have crime in New Hampshire, you’ll have crime in New York without a wall,” Mr. Trump said. Mr. Trump did not discuss the significant increase in cases of children being separated from their families as a result of his hard-line immigration policies. He spoke only a few blocks from a detention center, but did not go in. When asked by a reporter if he would visit it, the president said that he would like to, but that it would be up to the Secret Service. He did not go. He also criticized Democrats who have accused him of trying to manufacture a crisis to justify his $5.7 billion border barrier demand. “What’s manufactured is the word manufactured,” the president said. Kirstjen Nielsen, the homeland security secretary who accompanied Mr. Trump to Texas, reiterated the administration’s position that what is happening along the border is a crisis. Democrats have insisted that the administration faces a large-scale humanitarian problem that is a direct result of Mr. Trump’s policy, but argue that a border wall is not the right solution and that Mr. Trump has failed to make the case that there is a true security crisis. A local pastor sympathetic to the president emphasized during a round-table discussion that the crisis was “humanitarian” in nature. Still, Mr. Trump said that he had a “feel about things” and could sense Democrats moving toward his position. Representative Vicente Gonzalez, a Democrat whose district includes McAllen, was in Washington while the president visited his hometown. But he closely monitored Mr. Trump’s trip. “It’s all theatrics,” Mr. Gonzalez said in an interview, before insisting that Mr. Trump was somehow trying to escape the government shutdown with a victory.